Completely redesigned for this model year, the 2016 Wölvhammer retains many of the functional elements of our flagship boot while improving design and style. Our vision for the Wölvhammer transcended traditional cycling footwear and originated from the conceptual standpoint of a mountaineering boot. This inspiration remains in the newly redesigned Wölvhammer. We've removed the outer zipper and velcro in favor of a lace-up design with a gusseted tongue to keep wet winter weather out and warmth in. We redesigned the power strap to remove the restrictive D-ring and make it easy to grab with gloves. Rounding out the outside design, the full grain leather and ballistic nylon CORDURA® shell is extremely durable and adds some style. 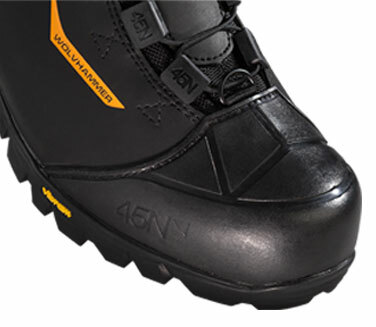 On the toe, we've added a protective rubber toe cap to help protect from impacts, abrasion and moisture. Beneath the shell, the waterproof membrane provides protection from the elements while allowing your feet to breath. 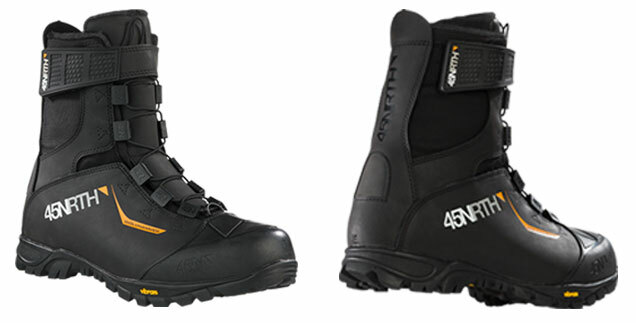 The dedicated hook on the toe box pairs perfectly with the Bergraven Gaiters for when the snow gets deep. Under the boot, the Vibram® outsole has deep lugs to clear snow and a wider profile for a better fit. There is a removabe cleat cover to enable use with flats or 2-bolt compatible pedals. On the inside we max out the insulation package with 200g Primaloft ECO Gold and line the boot with fleece to help wick moisture to keep your feet dry and comfortable. Carrying over from the previous years, the NASA approved Aerogel® insulation in the footbed blocks cold transfer from the cleats keeping your feet warm down to 0ºF. The new Wölvhammer will be available in sizes 38-50 (no size 49) in whole sizes only and will be available at 45NRTH dealers in late September for $325.